The first 7 hours the police reported, 3 officers along with 7 constables were killed and the encounter was still continuing. This encounter happened for 24 hours, after which Bhai Sahib attained shaheedi and went to straight to the laps of Guru Gobind Singh Ji. To stand against the oppression of the Indian government, many Sikhs laid their lives down and lived up to the words of Guru Granth Sahib Ji, “Purja purja kat maray, kabho na shaaday khet.” Shaheed Bhai Jagjit Singh Jaggi Udhoke is one of those shaheeds. 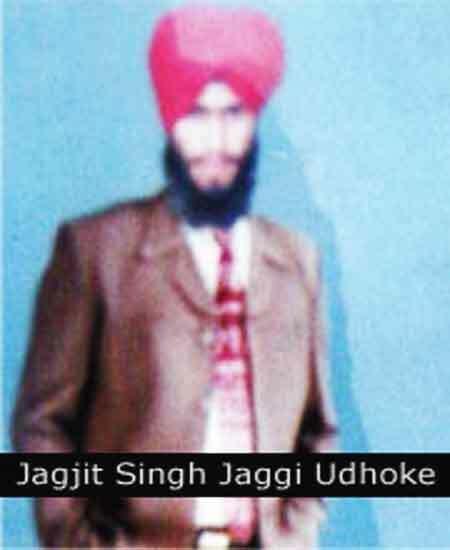 Bhai Jagjit Singh Jaggi Udhoke was born on 6th September 1969 from the womb of Mata Savinder Kaur and in the house of Sardar Darshan Singh. Bhai Sahib’s father, Sardar Darshan Singh was a motor mechanic in the Jaat regiment of the Indian army. Bhai Sahib studied up until +2 in Ambala. In 1986 after the retirement of Sardar Darshan Singh, the whole family moved and lived in the village of Udhoke. These were the year when the Khadku Singhs were fighting against the injustice the Indian government were serving to the Sikh community of India. To stop the voice of the Sikhs reaching the ears of Delhi, the Indian government started killing innocent Sikhs and raped Sikh girls. In 1990 the freedom fighting group of Bhai Jasbir Singh Jundair and Bhai Hardev Singh Kalia would regularly come to Bhai Sahib’s house and rest. Soon the police were given this information started harassing the family. When the police came to the house Bhai Sahib would quickly get out of the house from the back. In the middle of 1990 the police arrested Bhai Sahib from village of Bilowal. Bhai Sahib was blindly tortured but the police could not get any information out of Bhai Sahib about his group of Khadku Singhs. The police charged Bhai Sahib with many fake cases and sent him to Amritsar central jail. Later that year the family managed to bail Bhai Sahib out of police custody and bring him back home. Instead of going underground Bhai Sahib wanted to do actions secretly while staying at home, but some Khadku Singhs did not like this and labelled him as a black cat and started to threaten him. Having no choice Bhai Sahib left home and carried on doing actions. Bhai Sahib kept control of his name being mentioned in to the media. Then in the start of 1991 the police again arrested Bhai Sahib and was again brutally tortured. The police still could not get any information from Bhai Sahib on Khadku Singhs. The police again charged Bhai Sahib with fake cases and sent him to jail. After spending 6 months in Amritsar jail, Bhai Sahib came out on bail and tried doing actions from home, but the brainless Khadku Singhs did not allow this to happen. Bhai Sahib again left home and carried on doing actions. Keeping himself unknown was one of Bhai Sahibs great skills. While being underground Bhai Sahib did many actions and at the same time Bhai Sahib would attend his court hearings. At court Bhai Sahib would meet his parents and friends but not let the police know that he is meeting his family after a long time. 30th November 1992, Bhai Sahib along with some more singhs were in village of Chak Sakandar, district Fatehgarh. Here the singhs were resting at one of the electric tubal. The police was informed of the singhs location by an informant. The police rushed to surround the village from all sides. As Bhai Sahib had faced much torture, he was unable to run and escape. When Bhai Sahib saw the police, he told the fellow singhs to escape he, himself held the police back by firing bullets. Bhai Sahib did not want the local villagers to get hurt in the crossfire, for this reason Bhai Sahib quickly made to the farms away from village homes. As Bhai Sahib moved towards the farms, he shouted war cries and fired bullets at the Indian security forces. Soon the police entered the farm in bullet proof tractors as they were too scared to face the singhs of Guru Gobind Singh Ji themselves on the battlefield. 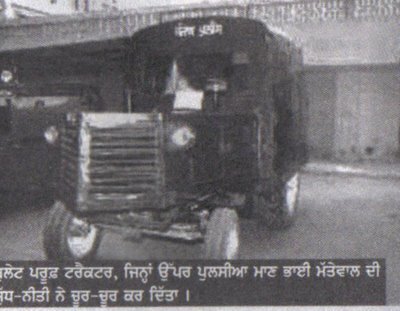 The police fired bullets at Bhai Sahib from the heavy machine gun attached to the roof of the tractor. Judging this Bhai Sahib planned to do something that will show his bravery and have the Indian security forces running for their lives. Bhai Sahib Everyone Was Dead Inside The Tractor/ 7 hours encounter was still continuing. Bhai Sahib got close to one of the bullet proof tractors and jumped on to its roof. Then Bhai Sahib stuck his gun down the hole in the roof and fired his full magazine into everyone inside. Once everyone was dead inside the tractor Bhai Sahib himself jumped into the tractor and started steering it. Bhai Sahib was driving the tractor and killing many positioned police officers, this was devastating for the police force. There was no limit to ammunition in the tractor which made the police officers run for their lives. The first 7 hours the police reported, 3 officers along with 7 constables were killed and the encounter was still continuing. According to the locals the loss of police was far greater than what the police stated, the police did not let this truth get into the media to avoid being made a laughing stock. This encounter happened for 24 hours, after which Bhai Sahib attained shaheedi and went to straight to the laps of Guru Gobind Singh Ji.